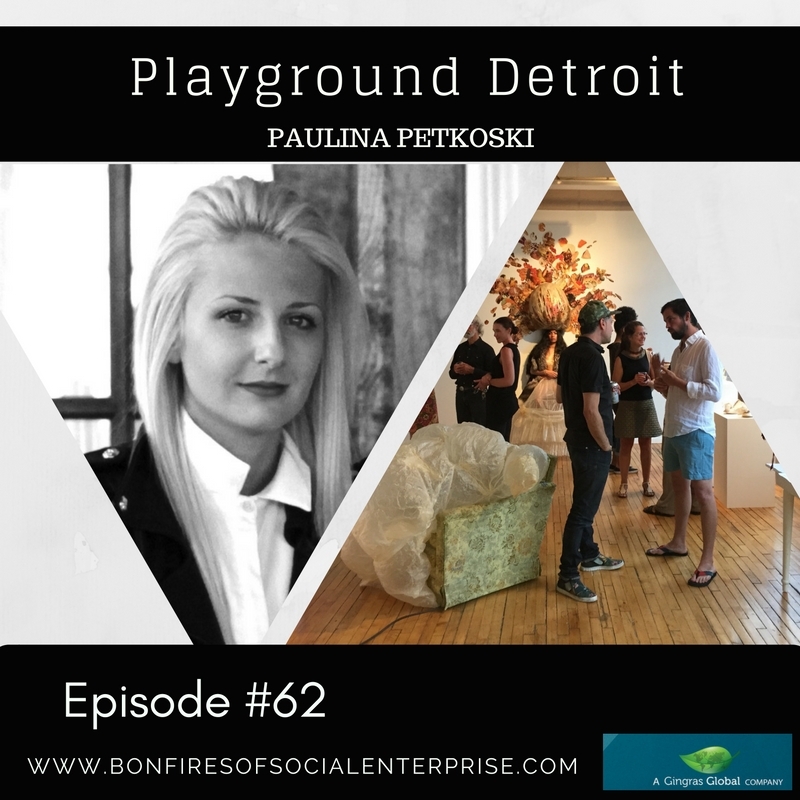 Romy interviews dynamo Paulina Petkowski, co-owner and co-founder of Playground Detroit! Learn about the multi-faceted organization and the exciting empowerment for artists and creatives. What talent! Romy: Hello there, this is Romy and I am excited to share another episode with you. We have Paulina Petkoski on the show today talking about a really fun and hop organization called Playground Detroit. At the end of the episode one of our Detroit artists, Valley Hush, debuts a new song. You don’t want to miss it! I would like to give a shout out to our listeners in the Washington DC and Virginia area. We appreciate you! Let’s see what Jentzen has for us for fun fuel for today. Romy: Hello there, this is Romy and I am excited to hsare another episode with you. We have Paulina Petkoski on the show today taling about a really fun and hop organization called Playground Detroit. At the end of the episode one of our Detroit artists, Valley Hush, debuts a new song. You don't want to miss it! Let's see what Jentzen has for us for fun fuel for today. Hey this is Jentzen with your fun fuel for this week’s episode. This week I will be sharing some fun facts about a playground! The idea of the playground originated In Germany where the playground was a space to teach children how to play properly. The first playground slide was invented in 1922 by Charles Wicksteed. Research shows that children who are given the freedom to play how they want grow up to be happier and more well adjusted adults. Playground also help children with their balance and motor skills as they play, social skills as they interact with other children, and self confidence when they swing and climb. A playground is also a great source of fresh air and exercise for a child. This is Jentzen with your fun fuel for this week’s episode. Enjoy the show! Romy: Excellent. I'd like to set the stage a little bit before we listen to my conversation. Detroit is busting with creative activity. Like any big city, you can almost find anything! In the past, it has been somewhat difficult to locate everything. That's where Playground Detroit comes in! Paulina: Playground Detroit is really a multi-faceted platform that serves as a creators catalyst for the city of Detroit and its creative entrepreneurs, artists, musicians, and cultural scene that's happening right now. Romy: Let's break that down a little bit more because you used some fresh terminology there. Multi-faceted, creative catalyst, let's go deeper on some of those elements. We have two sides of what we do, IRL and URL. The first part, IRL, is In Real Life, we work with people, and we produce events, we connect people to people, and we like to promote the creative economy. Promoting the arts and culture scene here through exhibits through really cool programming that includes film screening, Q & A panels, installations with other stores that are in the area. Anything that really allows people to connect with one another and experience art in a way that is really fun and unique. The other side of it is online. We have had an online magazine since 2011 that we started to really get out all of the fun, creative, news that's happening in this city that, at the time, wasn't being told in the mainstream media. Since we started the online magazine, we've also expanded the digital media platforms that we have to a really, amazingly, robust, social media following that is growing, basically every week. We have really great Instagram following and Facebook; we use Pinterest, Snapchat, YouTube, anything that really allows our audience to engage with the creative people that we support and promote. That's absorbing because there is always this gap that people who love the artists don't feel like they can get close enough to them sometimes, you provide both of these ways. I love what you just said, In Real Life, IRL, and URL. That's fantastic; I want to write that up somewhere. It's the easiest way to describe it because both sides are critical to supporting one another and that was all the intention when we started throwing events while living in New York to bring out talent there and showcase everyone there in order to get out the information about exhibition or a music showcase that we were doing. We had to be our own outlet, and that continued to be a part of how we function to this day. Let's talk more about you ... The genesis of the idea while you were in New York. Was somebody connected to Detroit, how did you originally connect new York to Detroit? I grew up in metro Detroit as did my business partner, Samantha Shefman and we were both living in New York, at the time post college for our professional careers. She worked as a jeweler and a gallerist, and I trained as a fashion designer, we were working in New York and what we found was that ... A lot of people would ask us what Detroit was like when we were introduced to them, and it was always with such interest but totally uninformed generalizations and stereotypes. To counteract that, we started the website, and we started doing events to connect our friends that were living it New York to the people that we still grew up with, in Detroit, who are doing really inspiring things that we thought should be exposed to. How did you decide to make the move? I decided to return to Detroit in May 2014 after some issues in the fashion industry were brought to my attention. I felt like my efforts and my experience and my passion for Detroit and what's happening in the city right now were better put to use on the ground. 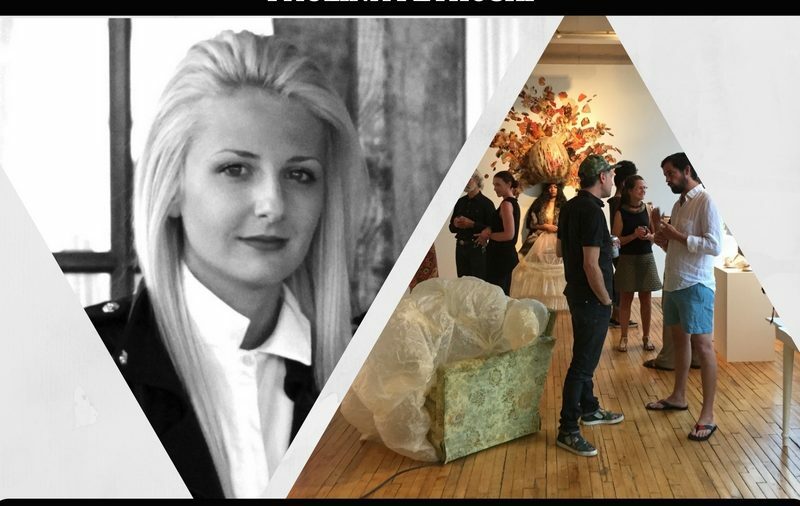 I relocated back in late July of 2014 and then a year after working in Chelsea in the gallery district in Manhattan, Samantha my partner moved back here in 2015. We've been operating back from Detroit for the past two years. You've made amazing headway in just two years. I'm sure, to you, it's felt slow but looking for the outside, two years, that's extraordinary what you've done here already. Thank you, I really appreciate that; it's been a lot of hard work, but I've been dedicating the majority of my time to establishing the company, back in Detroit. The funny thing was, when I moved back here, a lot of people I knew because my previous connections, I've been traveling here back and forth the whole time I lived in New York for almost ten years. People around town they already knew the name recognition, there was already brand recognition, when we brought the company back to the city. Which was really interesting for me because, originally, more of the intentions was to inform a larger audience, whether that's global or people who lived in New York or LA about Detroit. It's actually turned out that we have a really amazing following based in the city and also in the surrounding areas, metro Detroit, Ann Arbor, Chicago, other places that I didn't think we would have such an impact on and it seems like we do. I think there's this surprise sometimes of how much there really is going on around here. It's hard to curate it all and organize it all. Which you're doing. Thank you, it's interesting because there is so much happening, and I think, sometimes, that's super overwhelming to someone who's either just moved here or is just starting to become curious about the scene, the art scene has been strong in Detroit for decades, and I think now it's starting to just get more recognition and things are becoming a little bit more mainstream a little less underground. But there is also potential for a new audience and how do we let them in and give them access to stuff that was more word of mouth or more within the very small, tight-knit, community that's actually based in Detroit? Let's go there to the social mission; there's a broader social mission. Sometimes people dismiss the art and the creatives as not really adding to solving the social issues. Do you mind speaking into the social good that comes from what you're doing? I think what people need to realize about artists and creative people is that there's actually a lot of value added to the community, as a whole, and also to the GDP, economically speaking. It's not just ... Even though we like to be fun and creative and entertaining in what we showcase, it's real that we're a little bit more serious about play, if you will. In that this idea of play is really a new form of work and when you try to look at some of the future trends that are based on the big economy and an anti-capitalist potential future. What is the future of work looks like and I think that the people that we work with are all very passionate about creating change and impact through their creative or artistic pursuits? Public schools are in a crisis and the majority of the time, one of the first things that tend to get cut in the budget are the arts program, and a lot of the work that we've done in the past is art supplies fundraisers for some of the artists that we work with who are actually also teachers part time, as well. It's really important to advocate for the arts in Michigan because we're competing not just nationally, but globally for other cities that are looking to attract and retain their talent, and we have to do that in Detroit and Michigan and southeastern Michigan because that's really the feature of where a lot of people who are going to college right now or are budding artists, they need that support. They need to see themselves as being in several parts of the economy here, not just tech or farming or automobile industries, as we've seen them already, but really saying that creativity and art and culture matter. How do people really end up understanding that in a real way, not just a why is the painting on a wall important? It's much deeper than that because art can impact people's quality of life and provide jobs. That's at the more macro level what we're saying. I think there's so much. That was action packed. We could probably spend about an hour on every one of those things. I think you do ... I want to draw attention to two specific things you just said there, though, and I'll do from back to front. Economic development, there is jobs in arts and culture. People dismiss that because they may view it at times as a luxury item, but there are definitely, it creates jobs as it creates economy. It brings people to the city. Just think about all the people that come to look at one of the types of things that we have in Detroit, which is the graffiti. That's just a small hint of an example, but I'd like to go back to one of the things you said in the beginning, and it's about having fun. One of the things that cracks me up about social enterprise and impact investing is while it's great to have these good intents social missions, sometimes the social entrepreneurs are walking around like sad sacks. I'm going to save the world here, but there just depressed and trying to make it all happen. It really isn't the intent of social enterprise, in general. The intent of social enterprise is to marry the best of doing something good socially with the best of having a business enterprise, so it stays self-sustainable and healthy and productive. It's not meant to be this burden that you decide to carry yourself. I love the fact, I just wanted to step on that for a minute, that place of fun and play. It's critical that we do that in our world. It's really challenging because as a social entrepreneur myself, I'm faced with those challenges, and I do tend to take on this overwhelming amount of responsibility for the people around us that we work with and also the city as a whole. I think that the other community of social entrepreneurs that I am associated with all feel the same way. There is this intense feeling of what more can we do to help, so it does become a little bit overwhelming and sometimes potentially depressing because there's only so much that one person can do, but when you get back to the idea of enjoying what you do and making your work purposeful and keeping it fun, I think that that was the only way that there was able to be a counter-narrative to this depressing story of Detroit that's been touted in the media for decades now. How do you counteract that? I think that it's a lot of positive energy foremost, and then a lot of positive thinking and positive action. Let's fill the city with vibrancy and beautification and creative ways to reimagine what this city can be and how other cities that may be experiencing similar things of the industrialization and reorganization that's happening. Let's be something that they can look at and learn from as we've already experienced some of the worse that happened across the country to cities. Definitely. Well said, well said. There's no question I think all of us who are social entrepreneurs, we've reached so far and emptied our bank accounts and all of our pockets and all of our time clocks way more than we want, but yet, I know, myself, I am like, "Wow, super stretched," but at the same time, I've never had more joy than I've ever had in my whole life. I've never been more in love with other people that are all doing the same thing. While it is so tough, at the same time, there is this, I love that word, counter-narrative, that I'm having great joy, and I think a lot of others are, too, and you, at Playground Detroit are part of what's facilitating that actually. It's helping not to be so heavy all the time. Let's go to the enterprise part of your business because our listeners are always super inquisitive about what are things that people are trying. You're a for-profit business, which is really interesting. I'm going to comment on that in a moment because typically at least in our southeast Michigan area, a lot of the arts and cultural organizations have been nonprofit. What are some of the revenue streams you're looking into or have been using? I found that the nonprofit model for us as an organization didn't make the most sense because I think that things move very quickly. We like to respond to opportunities and partnerships and ideas as fast as possible, and I think sometimes you aren't able to move so quickly with a nonprofit. I also don't always think that the arts should have this charity mentality, which is a little bit more like, "Oh, you know, poor us, help us, save us," which is not all nonprofit messaging, but I think for the most part that there are ways for artists to work professionally and part of what our revenue stream is is being an agent or an agency for a freelance artist and creative entrepreneurs so we help facilitate these people who are highly skilled, often times educated at incredible institutions, like eCollege for Creative Studies or a lot of other places that people have studied at, and place them with job opportunities because they are working professionals even though I think most people would find painting a giant building more enjoyable than it is work. It definitely takes a certain skill set to be able to achieve something of that skill. Private commissions and corporate commissions for public artwork or lobby installations or restaurant, making other businesses integrate art into their spaces is a part of what we do. The other part is our exhibitions and events. We've done solo exhibits and featured artists programming. We also have online sales for artwork. We have an eCommerce market on our website. We sell art and prints and Playground merchandise. We're looking to expand what we offer through unique collaborations with the artists that we work with, limited edition, things that people can buy that are at a bit more affordable price point than the artwork so that we can cultivate a collector's market, whether it's young, new collectors or appeal to experienced, older collectors in the area or the metro area that want to invest in the top emerging talent in Detroit right now and provide those opportunities. ..and banner opportunities because our traffic on the website continues to grow and the traffic is coming in from all sorts of places. It is a global platform so trying to monetize those opportunities and certainly with the new opening of a store location that we are currently working on, I think that's just going to be another opportunity to have a direct point of contact for customers and visitors and other collaborators that we work with to be in a space that actually represents local artwork and potentially bringing in people from outside of Detroit to showcase what they have going on in other parts of the country to our audience here. I think that that synergy is important to keep people inspired and informed of, not what's just happening locally but everywhere else too. Cool. You're trying all different kinds of...opening all kinds of doors for potential revenue. What would you say at this moment your ideal client would be or customer. If you said, "Hey this would be ideal if I had more of these." I think that some of the developments that are happening around the city, so people who are building lofts or other offices that want to integrate art into their spaces would be great. We're working on a commission right now with an artist who's doing a large scale mural and an accompanying series of work for one of the new buildings for people living in the city. I think as there is more new construction brought into Detroit, I think that we have the relationships and the network of high performing artists that are young and ambitious and talented who are looking for work opportunities on a bigger scale and are ready to take those on. Of course, it's not all about the big clients. I think that more beginning collectors are also great. The art market in Detroit is a bit different than it is in New York or other cities but how do we start to train and teach people that maybe even if you can't afford $1500 or $5000 painting that you can still purchase a $40 print and frame it yourself and start to enjoy some of the benefits of, not just beautifying your own home or office but knowing that you're actually supporting other people's careers and choices so that they can continue to build themselves as well. Yeah definitely. Definitely. Let's go to this last point I wanted to make sure I covered. You eluded just earlier to the fact that you're looking to get into a new space. I know one of your social missions is about preserving spaces in sustainable ways. You moving into a space has, of course, a dual purpose of showcasing your work but would you touch on that for just a minute on your social mission to preserve spaces? What I've seen from living in New York was a rapid transition from Williamsburg and North Williamsburg along the waterfront which was very warehouse-driven and industrial and not very occupied in 2007, 2008 to now having this huge influx of luxury high rises. All of the DIY music venues that were formerly there have been pushed further and further outside of that area. More recently in contrast or similar to Detroit, few art organizations like Whitdel Arts and Northend Studios have recently had to close their spaces and are looking for other places to move into. This is a trend that quite frankly scares me because some of these places have been around for so long and have been one of the main drivers of bringing people back into the city that formally swore they wouldn't visit anymore. Now it seems that with the development that I was speaking about earlier presents a tension because these people have obviously created value and made certain neighborhoods or areas or buildings...they're desirable, and now they have no equity. They have to....either they can't renew their lease, or it's become too expensive. There're a few lofts that were artist lofts right downtown near Capital Park that has now transitioned into luxury lofts. I think although both are needed I think that there has to be room preserved for the creative pursuits that were already happening here and continue to need to happen here if people still want to find this place interesting and unique as opposed to where Bedford Ave in Williamsburg now has a Starbucks where there were a mom and pop coffee shop, a CVS where there was a mom and pop pharmacy and an Apple store now where before there was a salvation army. There's a lot of changes going to happen and continue to happen which is fine. I'm not saying that it shouldn't but where is the preservation of the original, unique characteristics of the city and how do we either do what Grand Rapids has done where they've offered store fronts at a reduced rate for artists of live workspaces or offering up vacant store fronts for installation purposes or pop-ups or whatever it may be. How do these two actually work together as opposed to canceling one out? Right. Right. Well, man, I'm really glad you moved back Paulina. You and your partner. Thank you. You know what's funny is, a couple of years ago in New York, I just had this idea. I'm really into street art. There's a ton of wheat pasting and graffiti and stickers that I would see all over New York, and I started making these stickers that said New York doesn't need you. I would just put them around and document them. I just felt like why do people keep moving to New York. There're 8 million people living there. They certainly don't need another graphic designer out of college. They don't need another fashion designer working endless hours at a job where they're never gonna be the next Calvin Klein because the industry's changed now. It just seems like there isn't a lot of impacts to be had in New York and I think in retrospect it almost seems like that message wasn't really just to everybody else I knew, it seemed to actually be speaking to myself. I felt like what am I doing here anymore. I got what I needed out of New York which was a ton of experience, a ton of contacts, and a great network of amazing people, a drive and a really big passion on how to get things done, how to work hard, how to survive. At the same time what I've been able to get myself into back in Detroit and work with people one on one and try to bolster the creative economy here has been so much more rewarding and impactful from what I've already seen and heard from individual feed back. I'm really happy I'm back here as well. THat's good. How would our listeners reach you? Maybe website? I know you eluded to social media, Instagram. Would you give us those addresses? Yeah, so we are at playgrounddetroit.com. That's where you will find our online magazine and our eCommerce platform. We also are on Facebook at playgrounddetroit. Our handle for Instagram and Twitter is @playdetroit, and you can email us at info@playgrounddetroit.com for any inquiries or special requests. We do get pretty busy with...we've had job applications, we've had international artists from all over the world contact visitors and us as well just to kind of figure out what's going on here but we're always open and I love getting these emails from anybody and everybody about what we're doing and how we can potentially collaborate. Very good. Anyone out there who might have a potential customer or client for Playground Detroit or add value in some way even just connecting and support them. We really appreciate it. Paulina thank you so much for taking so much time to allow us to hear your story, and we're with you. Thank you so much. I really love the opportunity to speak about this and looking forward to hearing the rest of the podcasts that are coming. Okay, and I know you're going to pick out the end song this time. Usually we choose it, and this time, you're going to pick it. We look forward to hearing what that's going to be. Yep shout out to Assemble Sound! We love you guys.